Applications for the 2018 Sydney Festival Arts Industry Program are now closed. Please check back in mid 2018 for information on the 2019 program. The Sydney Festival Arts Industry Program is aimed at providing greater access and networking opportunities for people working in the arts sector. 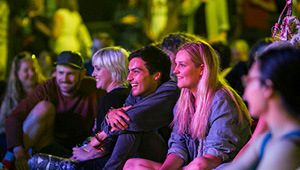 Up to six (6) $36 Arts Card tickets available to most Sydney Festival events and one (1) additional concession priced ticket for a guest to the same event (where concession prices are available). Access to exclusive artist and industry events. A professional performing or visual artist is a person who creates works of performing or visual arts, who is paid for their artistic practice, whose practice contributes to the development of art and culture, and who is recognised as a professional artist by their peers. An arts worker is a person who works professionally in the performing or visual arts and contributes directly to the processes of making art – but is not necessarily an 'artist'. (Examples of eligible professions include paid stage managers, production managers, lighting, sound, set and costume makers and designers, arts marketers, producers, curators and programmers). Please note that teachers, students, ushers and hospitality staff are not eligible for this card (unless your arts practice is in addition to this work). Please note: to qualify for the program, artists and arts workers must be currently practicing – this means having at least one work professionally funded, developed or produced in the past 12 months. The Arts Industry Program is open to Australian residents only, although work undertaken overseas is eligible for qualification. For more information or any enquiries please email artscard@sydneyfestival.org.au.